Toyota chief Akio Toyoda: "I am very, very regretful that this has happened"
Toyota is to recall the latest model of its flagship Prius cars because of a possible fault with the brakes, reports from Japan say. The firm did not comment on the reports, but said it would be announcing soon what action it would take over problems with the Prius. Toyota has already recalled about eight-million vehicles with faulty accelerator pedals or floor mats. 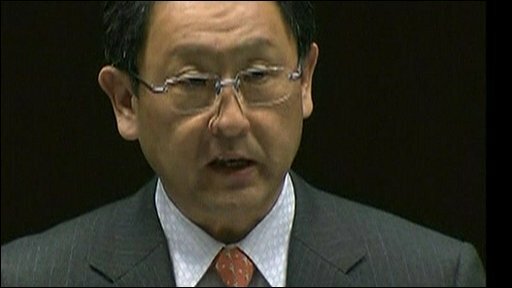 Company president Akio Toyoda has publicly apologised for the problems. The brake problem is thought to affect about 270,000 Prius models that were sold in the US and Japan starting last May. Toyota blames a software glitch and says it has already fixed vehicles sold this year. Reports say the recall could be extended to Europe, China and other countries. Toyota says about 6,500 Prius car owners in the UK would be affected. According to Japan's largest newspaper, Yomiuri, Toyota has already notified car dealers in Japan that it plans to recall its latest Prius model. It will make a formal announcement after reporting to the government, according to the reports. It is unclear whether a similar total recall is planned for the US, but dealers there have reportedly been told that Toyota plans to repair the brakes on thousands of Prius vehicles. The US Transportation Department said last week it was investigating braking problems in the 2010 Toyota Prius after Toyota admitted brake problems with the model. The US National Highway Traffic Safety Administration has received 124 reports from drivers about the braking issue, including four of crashes. The US investigation will look into allegations of momentary loss of braking power while travelling over uneven road surfaces. Toyota said the glitch was not legally a safety hazard, and that it had received no reports of any accidents related to it. Toyota estimates its losses will reach $2bn (£1.23bn) in costs and lost sales from its worldwide recall of vehicles that might have faulty accelerator pedals, but a recall of Prius models would send this figure even higher. But these losses could escalate if the trust and reputation the company built up over a period of decades is demolished, observers say.